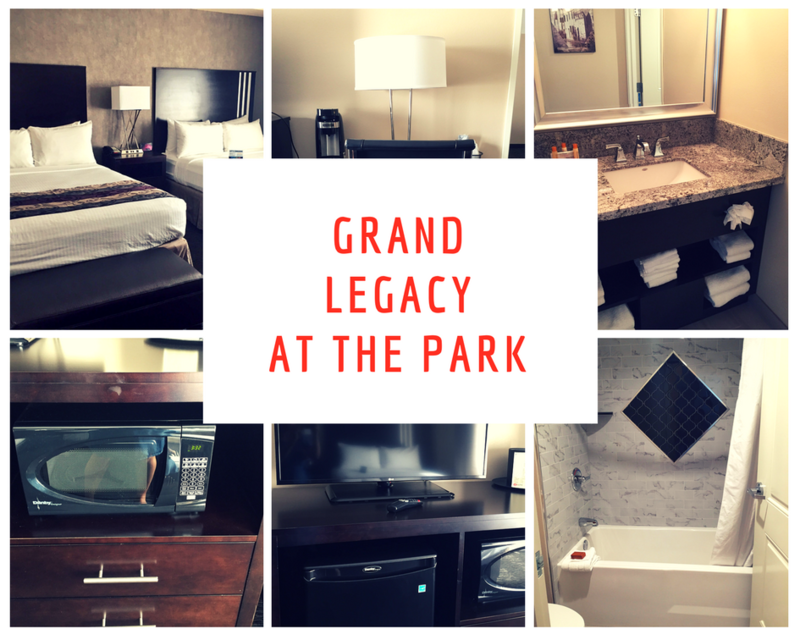 Just steps away from the happiest place on earth is a hotel with convenience, class, and comfort known as Grand Legacy at the park. Previously under the Ramada brand, this hotel underwent a $12 million development and renovation to make this hotel the latest star in Anaheim’s evolving hotel inventory. **Rollaways and cribs are limited and available on a first come, first serve basis at no extra charge for Deluxe, Premier, Luxury and Suite room types. Premier rooms – 325 square feet. These rooms are featured on the east side of the property facing the pool. Their modern look and spacious layout have led them to become a guest favorite. Accessible rooms– These rooms ADA accessible rooms available in all room types. Roll-in showers included in select rooms. Kids will immediately be drawn to the outdoor, heated pool with a kid’s splash area, as Grand Legacy boasts one of the largest kid-friendly pools in the area. There are two palm trees that spray water as well as two water cannons and a blue hose contained in a splash pad. There is also a nice sized jacuzzi that will sooth sore bodies after spending a whole day walking around the parks. The food options at Grand Legacy are plentiful and affordable! At the front of the property you will find Pizzaterian, Jimboy’s Tacos, and Creamistry. Our favorite is definitely Jimboy’s Tacos as we love the quality and variety of the menu. if you have never had their Queso dip, I highly suggest you get a large order and share it with friends. Also delicious are their taquitos and guacamole. Simply the best! Looking for dessert? Try the Creamistry. At the Creamistry, guests can watch specially trained Creamologists use liquid nitrogen to hand-craft our premium ice cream, one scoop at a time! They don’t make it until you order it – it doesn’t get any fresher than that! Below is a video of what the process looks like! The FIFTH is Anaheim’s only rooftop restaurant & bar. It’s the perfect place to relax and unwind with an assortment of artisan crafted dishes for sharing, cocktails, live music and stunning views. The Fifth become 21 and older after 10pm. Did you know you can watch Disneyland Fireworks from here! I is quite a sight to see. Purchase your disneyland tickets at the hotel. You can buy them there directly. it will save you a lot of time. Parking can be a little tricky here. Keep an eye out for the parking fee of $15 per night as well. Valet service is included in that price. Valet service is optional in theory but it is necessary much of the time since non-valet parking spots are extremely limited. For more information visit Grand Legacy on Facebook and Twitter.